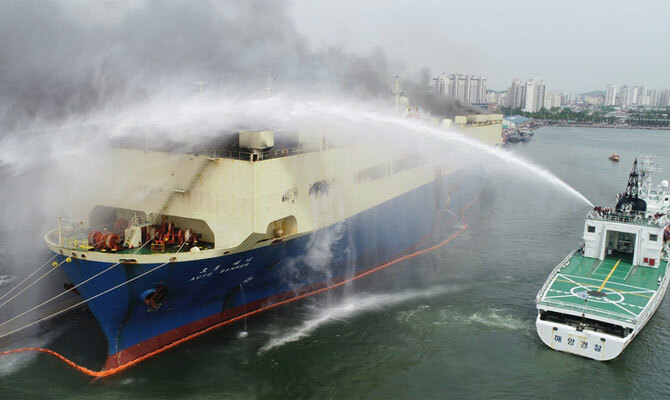 Car carrier major fire, Incheon. Extinguished. 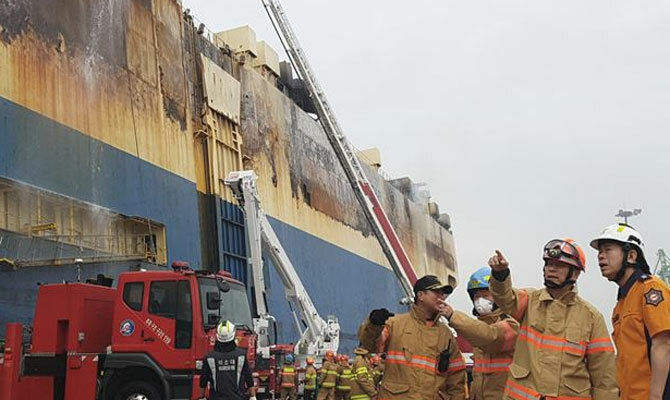 In the morning May 24 official statement said, that the fire on board of car carrier AUTO BANNER was extinguished after 67 hours of large-scale firefighting, involving hundreds of firefighters and dozens of engines, tugs and SAR ships, and helicopters. Of 2440 cars on board, some 1500 said to be burned down, together with 5000 tyres. 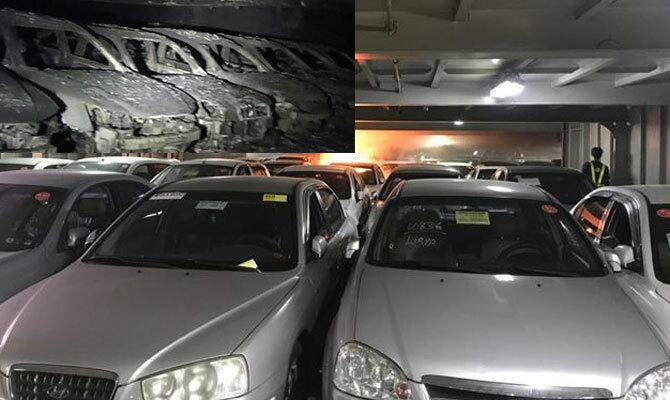 As of now, it is believed, that overheated engine of one of the cars located somewhere in the middle of cargo deck 11, was the cause of the fire. Investigation is under way, it will take not less than a month to determine the cause of the fire. 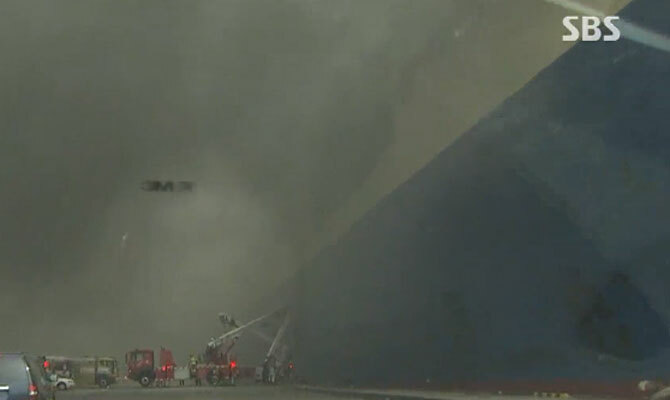 By morning May 23 fire said to be under control, soon to be fully extinguished. 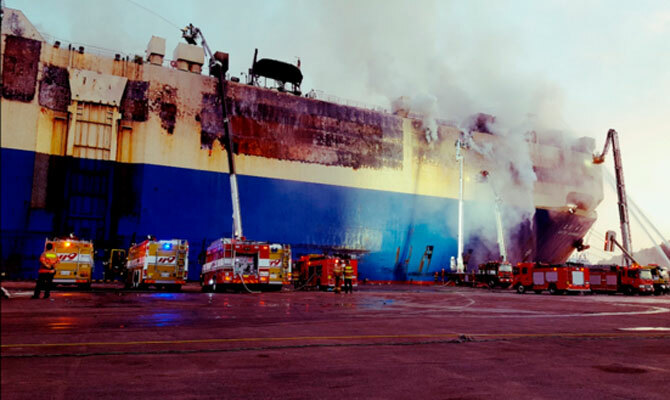 There was still fire on cargo deck or decks in stern section. 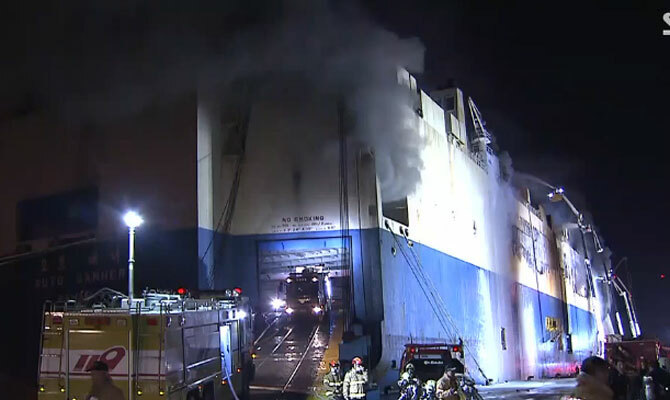 Firefighting is still going on, officials said it will take 1 or 2 days more to extinguish fire, cool the insides of cargo decks and make sure nothing is smoldering. 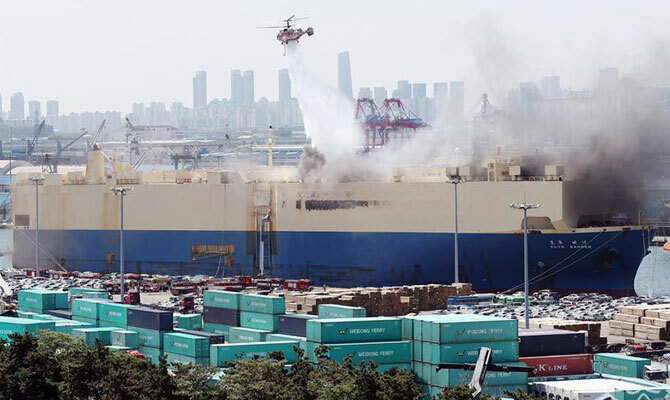 As of afternoon May 22, firefighters entered cargo deck 10 in breathing apparatuses, and found, that cargo deck 11, where fire originated, collapsed onto cargo deck 10. 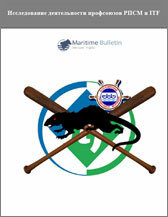 It is said, that 1460 cars on decks 11-13 were burned, several cars on deck 10 also burned out. 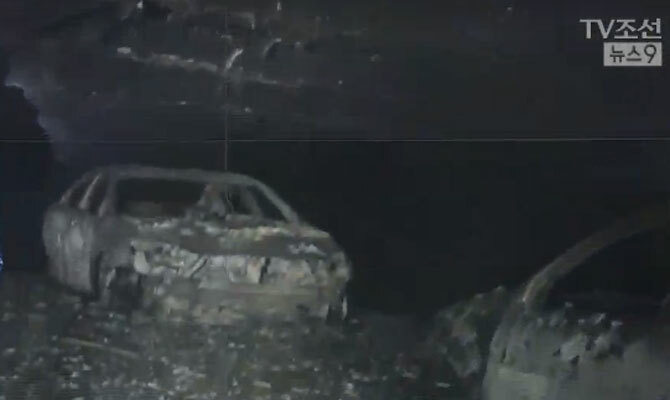 Heavy black smoke emitted by burning tyres spread as far as 10 kilometers from port. 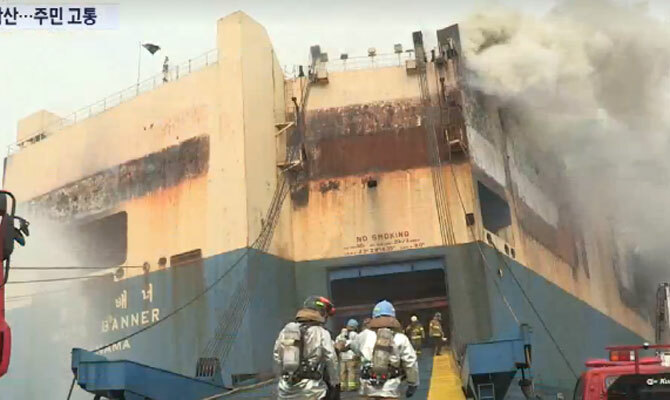 Firefighters had to cut several holes in ship’s hull to get access for pouring water and foam inside, as cargo decks engulfed by fire turned into giant furnace, and firefighters couldn’t get to fire otherwise. 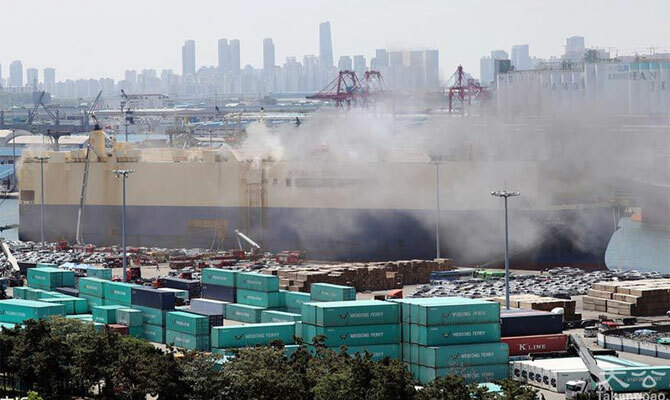 May 22 Update 0330 UTC: By 0100 Seoul time officials said, that fire was more or less under control, threat level was reduced, but still, fire is far from being extinguished. Fire started on 11 cargo deck. 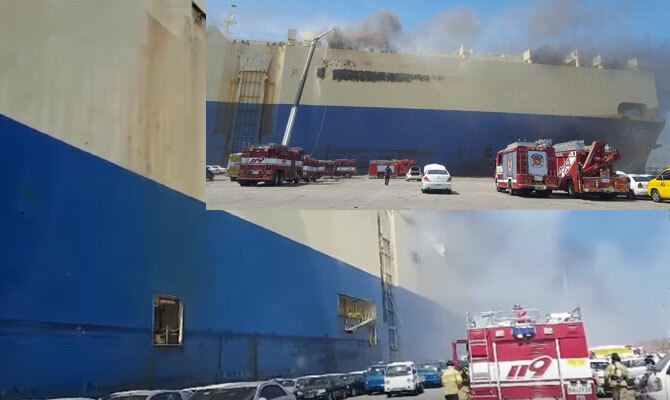 May 21 Update 1500 UTC: The fire is still raging inside AUTO BANNER car carrier, yet not under control. 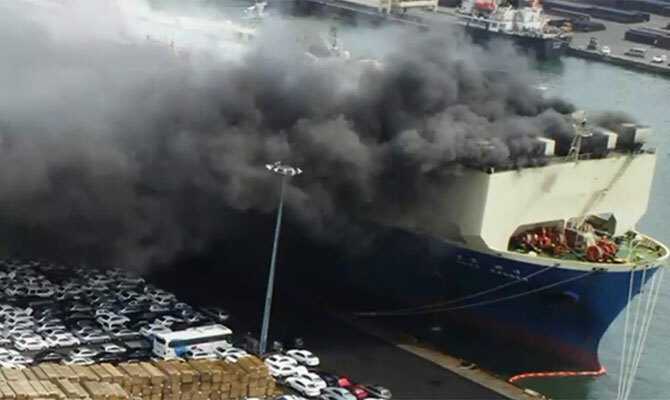 As it came out, there are some 2100 used cars on car carrier’s cargo decks, and some 1200 of them are on fire. 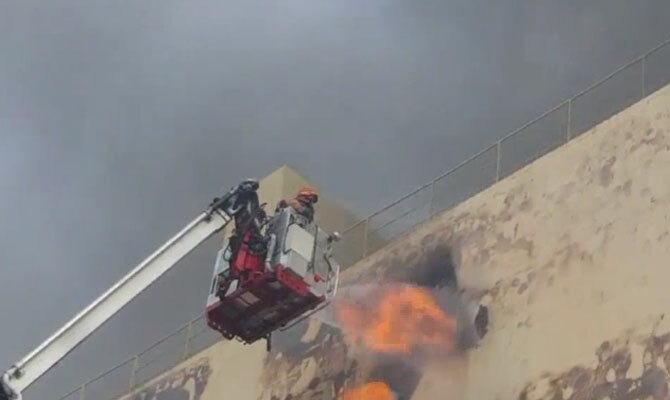 Officials said there’s little hope of extinguishing fire or taking it under control during night time. 3 teams of 8 people each said to be on board, engaged in firefighting. Some reported said, there’s a thick smog billowing from port with strong chemical smell. 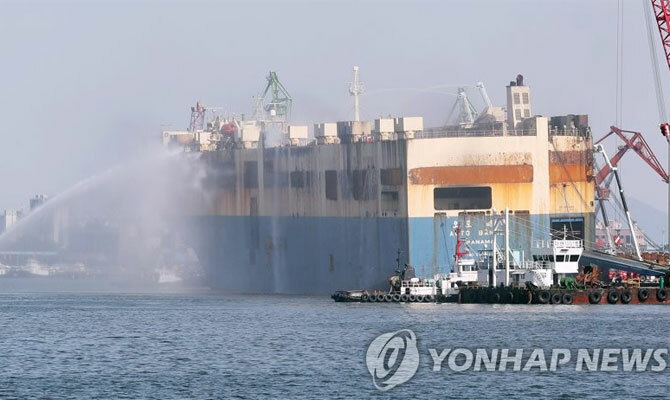 Fire erupted on a cargo deck of car carrier AUTO BANNER at around 0940 Seoul time May 21 at Incheon port, Korea. 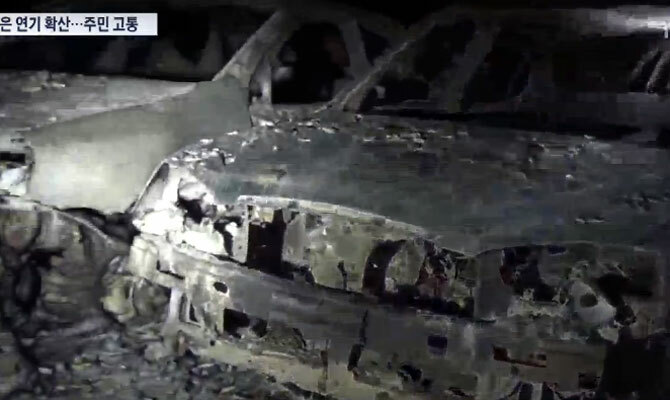 Reportedly, overheated engine of one out of 200 loaded second-hand cars destined for Libya caught fire, which spread around other cars. 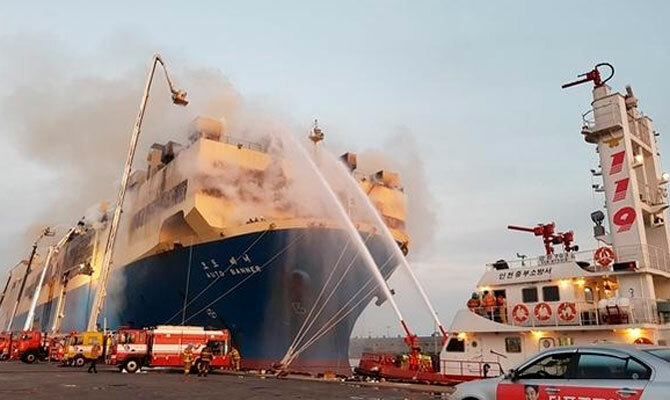 Fire is considered to be major, some 40 engines, helicopters and tugs, 150 firefighters in total, are engaged in firefighting, ship’s crew reportedly evacuated. On photos burning AUTO BANNER. Car carrier AUTO BANNER, IMO 8608066, GT 54222, built 1988, flag Panama, manager Hyundai Glovis.